Appointed to the deputy director position in April 2007, she shares responsibility with the center director in managing the Kennedy team of approximately 8,600 civil service and contractor employees, determining and implementing center policy and managing and executing Kennedy missions and agency program responsibilities. 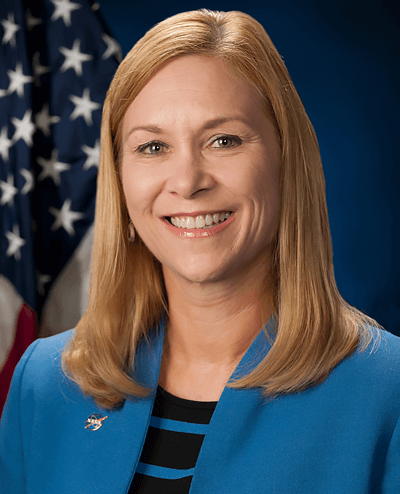 She served a 12-month appointment at NASA Headquarters in Washington, D.C., as the deputy associate administrator and acting director for the Office of Evaluation. Petro began her professional career as a commissioned officer in the U.S. Army after graduating in 1981 from the U.S. Military Academy at West Point, N.Y., with a Bachelor of Science in engineering. She served in the U.S. Army’s aviation branch with various assignments overseas in Germany. She also holds a Master of Science in business administration from Boston University’s Metropolitan College. Prior to joining NASA, Petro served in various management positions for Science Applications International Corp., also known as SAIC, and McDonnell Douglas Aerospace Corporation. At SAIC, Petro held a number of positions, including program/project manager, division manager, and deputy operations manager for several entities within the corporation’s operations. She interfaced with NASA, the U.S. Air Force, the U.S. Navy and commercial entities on numerous aerospace and military programs. As the interface to senior-level government customers, Petro was responsible for overseeing program and project managers and providing operational guidance on various technical programs. At McDonnell Douglas Aerospace, Petro advanced from mechanical engineer and cargo manager for processing classified payloads for space shuttle and expendable vehicles; to program manager for executing a classified, multimillion-dollar U.S. Department of Defense program, integrating payloads onto various space vehicles at U.S. Air Force and NASA facilities; to senior manager in Advance Products Division; to senior manager for Communications and Data Systems Division. Originally from Detroit, Mich., she now resides with her family in Indian Harbour Beach, Fla.